I’ve only been serious about bread baking at home for 10 months now. In general, I bake at least a loaf a week just for Betsy and I to use for sandwiches and stuff. I’m getting pretty darn good at it! Of course, I definitely don’t consider myself a “baker” by any stretch of the imagination. That said, I think you can’t learn how to swim by standing on the side of the pool and I wasn’t going to get any better at baking unless I pushed myself a bit. So I thought I would try my hand at the bread that takes years to master (and that is assuming you are making like 50 a day): The baguette. I have a long way to go until I master these guys. But, I thought I would share my first attempt at a homemade baguette, because I think it turned out pretty good. Before I get into the post too far, I want to give two shout-outs because seriously, I wouldn’t have been able to get very far without Pete’s post on Baguettes and the Baker’s Banter post. In fact, I didn’t include a lot of photos regarding the shaping of the baguette because the Baker’s Banter post is spot on with that. My first and somewhat successful attempt at making homemade baguettes! 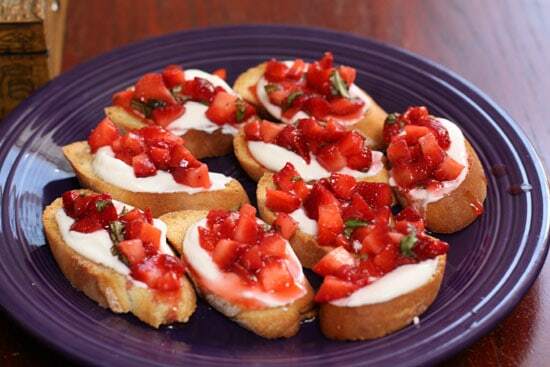 1) Mix starter ingredients together and let sit about 14 hours at room temperature. 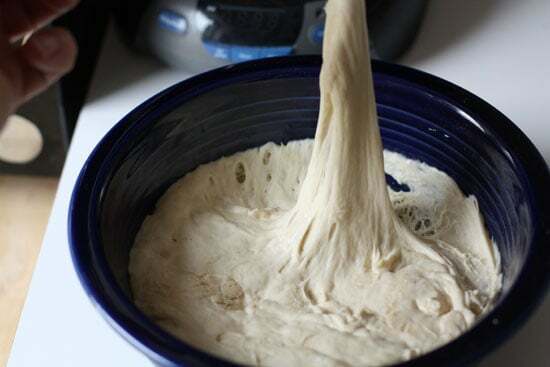 2) Combine yeast and water for dough and then add starter. 3) Stir in flour. Once you form a dough ball, you will either want to mix this with your dough hook or if you are old school (poor) like me, you want to knead it until you have a smooth ball of dough that passes the windowpane test. For me this was about 15 minutes of serious kneading. 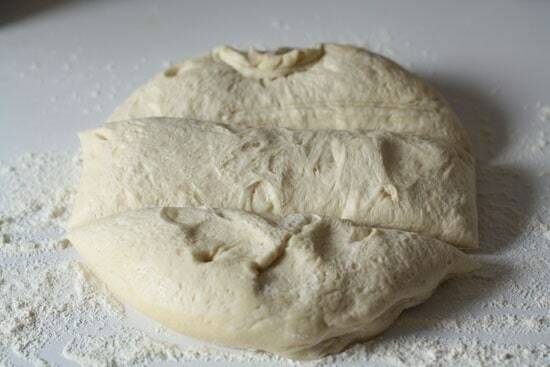 4) Lightly oil the dough and let it rise for 3 hours. After one hour, deflate it and give it a turn. Then let it rise for 2 more hours. 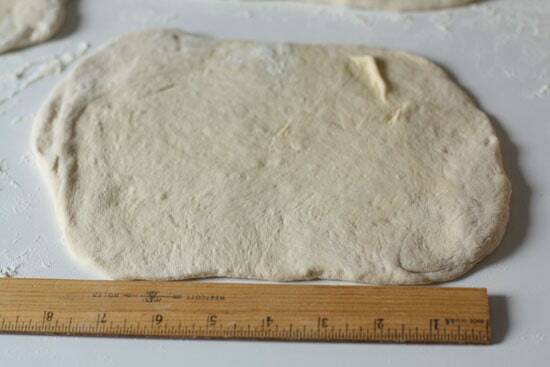 5) Cut the dough into thirds. I recommend weighing it and not just going by sight. 6) Take each of your thirds and flatten it out into about an 8 by 5 inch rectangle. Then fold it over but leave about 1/2 an inch on the bottom. Where the two halves meet, press lightly to seal it. Flatten it out again and fold it one more time. 7) Roll up the baguette, sealing the edge and lightly roll your baguette back and forth until you have your 18 inch baguette. 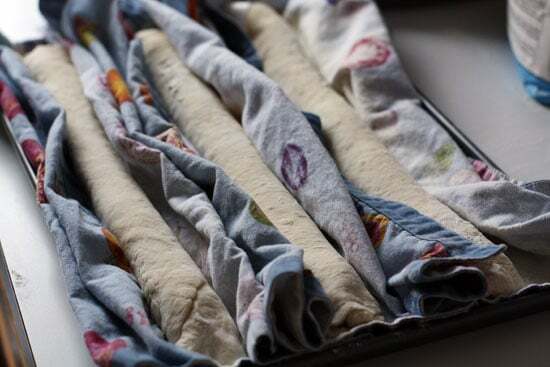 Proof the baguettes for 30 minutes in a few towels dusted with flour. 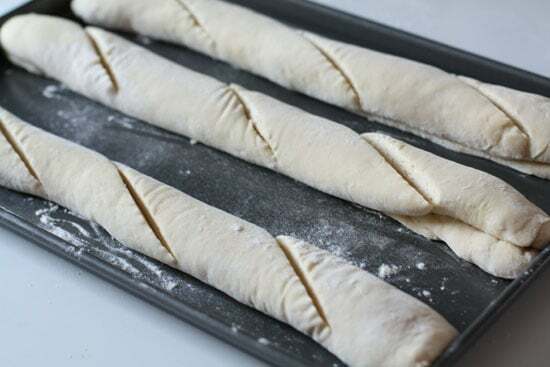 8) Put baguettes on a baking sheet and spritz with warm water. 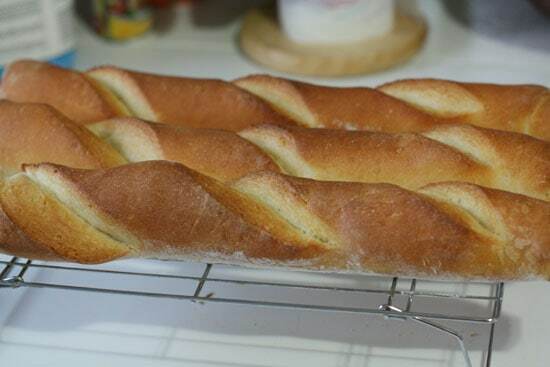 9) Score baguettes on the diagonal with a bread knife (serrated knife). 10) Bake for 25-30 minutes at 450. Check them at 20 minutes though. Cool them immediately on a rack. Let them cool well before slicing and serving. I used the recipe in the BB post for these guys. Next time, I’m going to use the recipe Pete uses though just to try that one out. The traditional baguette requires a starter. Basically, this is a very moist piece of dough that you let ferment overnight. 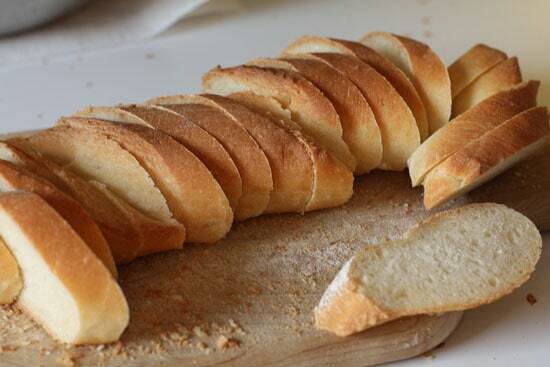 It gets the yeast very active and also gives the bread great flavor. Mix this all together and let it sit for about 14 hours at room temperature. The next day you will find what I like to call GOOP. 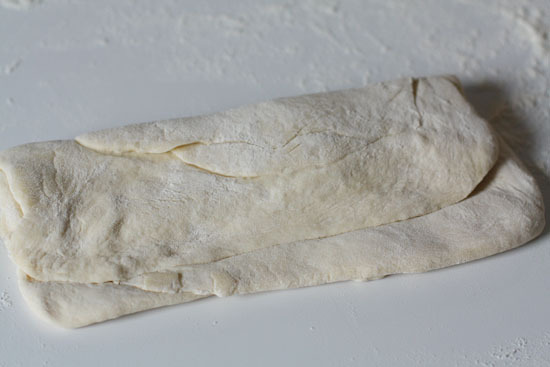 Now you can use your goop to make the baguette dough. Combine your water with your yeast and salt and then add your starter. Situation on the left made me nervous. I started adding my flour immediately and stirring. I was skeptical that my starter would distribute evenly, but eventually it did. Once you form a dough ball, you will either want to mix this with your dough hook or if you are old school (poor) like me, you want to knead it until you have a smooth ball of dough that passes the windowpane test. For me this was about 15 minutes of serious kneading. As an aside, I decided that it would be a good idea to make these guys while we were hosting 6 ladies for a bachelorette party over the weekend. I think Betsy’s friends think I’m a very strange man as I was spending my Saturday night yelling at dough that refused to pass the windowpane test. 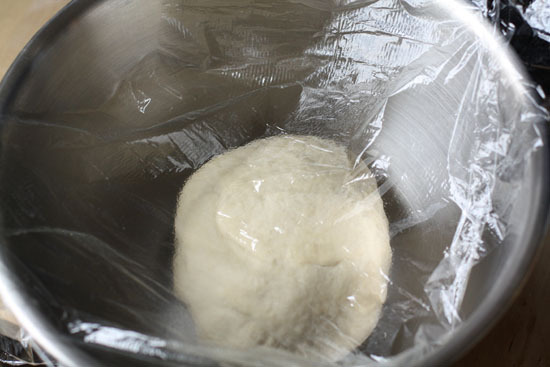 Eventually, my dough did pass the test though, and I was able to lightly oil it and cover it loosely with plastic. After 15 minutes of kneading…. 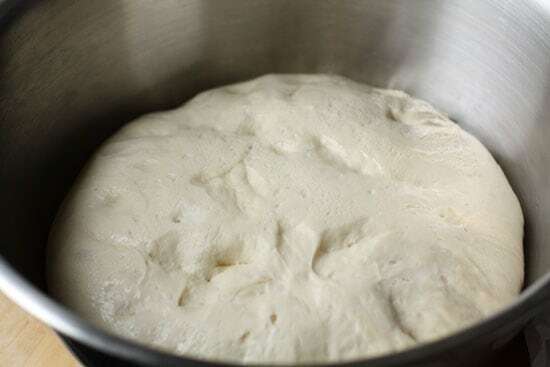 The dough needs to rise for 3 hours. After one hour, deflate it and give it a turn. Then let it rise for 2 more hours. You need to cut this into thirds unless you want to make one 6 foot baguette which would be awesome. I tried to do this by sight and failed. Ended up weighing the thirds. Take each of your thirds and flatten it out into about an 8 by 5 inch rectangle. Then fold it over but leave about 1/2 an inch on the bottom. Where the two halves meet, press lightly to seal it. Flatten it out again and fold it one more time. I got sloppy with this and forgot to take the photos necessary to really show you the process. Seriously though the baker’s banter post has really awesome step by step instructions on shaping. 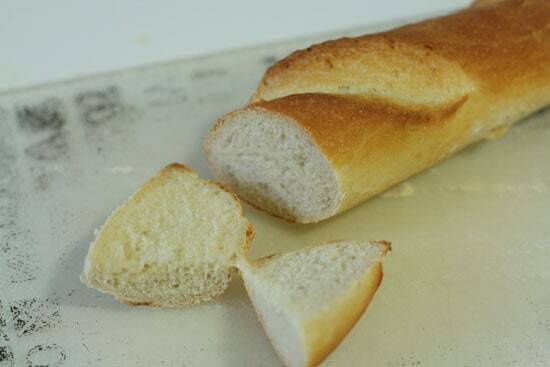 Eventually you will be able to lightly roll your baguette back and forth until you have your 18 inch baguette. I decided to be super-French and let these guys proof in a couche which is French for kitchen towel rubbed with flour. Ok. That’s not what it actually means, but I don’t speak French so that is what it means to me. I don’t have the traditional cloths used for this. I used kitchen towels and they worked just dandy. This is the baguette equivalent of a nap. These need to rise although you don’t want them to double in size. I let mine rise for about 30 minutes. They will rise more in the oven. 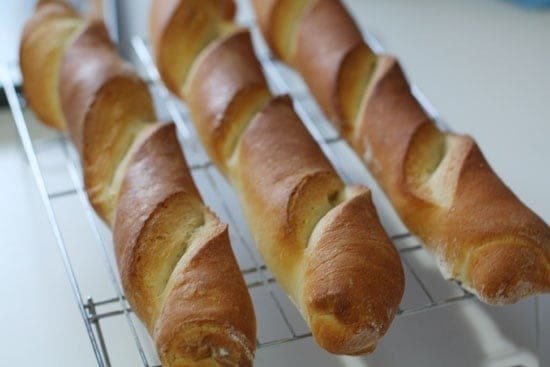 Then put your baguettes on a baking sheet and spritz them with warm water. This will help the crust relax and grow a bit in the oven. It will also create that crunchy crust that baguettes are known for. I didn’t spritz my baguettes until after the below photo, but you should do it before. I just forgot. Then score your baguettes on the diagonal with either a serrated bread knife or a razor. I got a little carried away with my scoring. Probably because I wanted to impress the bachelorette party attendees. I got a bit too ninja with the knife. Bake for 25-30 minutes at 450. Check them at 20 minutes. Cool them immediately on a rack. I’m thinking I’m happy with this. I was pretty happy with these and they tasted good. I was a bit disappointed with the crumb structure. I wanted larger holes, but I’m happy with this for a first attempt. Also, it is pretty hard to mimic the artisan hearths that create those lovely, large crumb structures in a home oven. A better crumb is desired. But like I said, I was pretty happy with these for a first attempt. I am such a ninja. I ate half of one of these with olive oil and it was really tasty. The other two and a half I used to make some breakfast bruschetta for hungover women at brunch the next day. The thing I reconfirmed with this baguette attempt is that while it may be hard to perfectly master something in the kitchen, it typically is within reach to make a very tasty version of it. With a little research and patience I was able to shake off at least some of my fear regarding these strange tubes of bread. Lots of people have learned how cool it is to get Macheesmo via email or RSS. Join the club. Sorry about the crumb texture; but hey, they look perfect to me!! Bread-baking is definitely something that takes a lot of time and practice (and patience, which I lack, haha). you’re too hard on yourself- this is a fantastic first attempt!! While I will never, ever attempt making baguettes, I thoroughly enjoyed reading this post and admiring the lovely pictures. Bravo! These are beautiful – I’d be a very happy lady to have been at that bachelorette party and have fresh baguettes!